London, UK. 19.12.11 - The latest film from Sherwood Pictures and Alex and Stephen Kendrick (Fireproof, Facing the Giants and Flywheel) is the action-packed inspirational drama Courageous, debuting on DVD February 27 from Sony Pictures Home Entertainment and AFFIRM Films. Courageous will have families laughing and cheering as they are inspired by everyday heroes who long to be the kinds of dads that make a lifelong impact on their children. Bonus materials include four behind-the-scenes featurettes, deleted scenes, a blooper reel and commentary by The Kendrick Brothers. 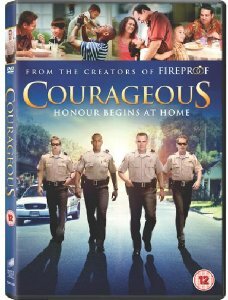 Courageous will be available for £19.99 (DVD). Directed by Alex Kendrick from a screenplay by Stephen Kendrick and Alex Kendrick, Courageous was produced by Stephen Kendrick, with Michael Catt, Jim McBride and Terry Hemmings serving as executive producers. Courageous has a running time of 124 minutes and is rated 12.